This week my dear cousin is retiring from years with the Sheriff's Department. 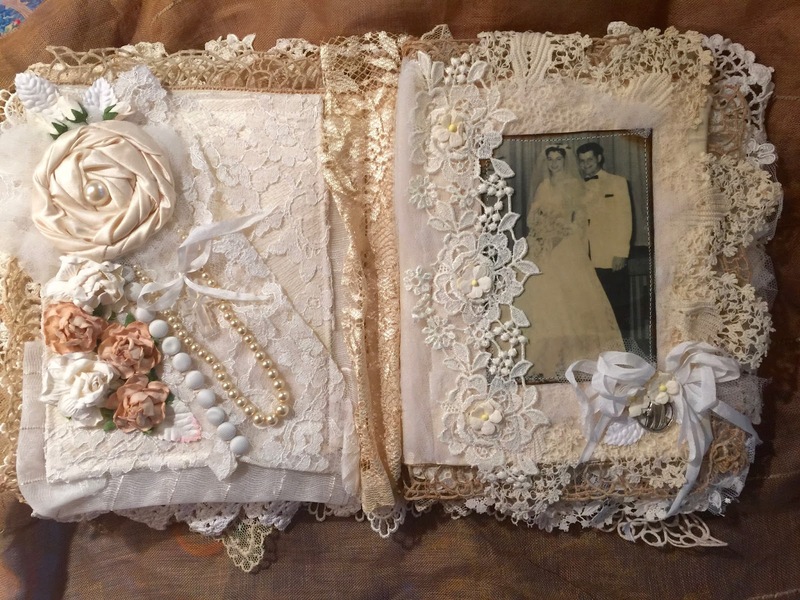 With the help of her mom, I was able to photocopy her family wedding photos. 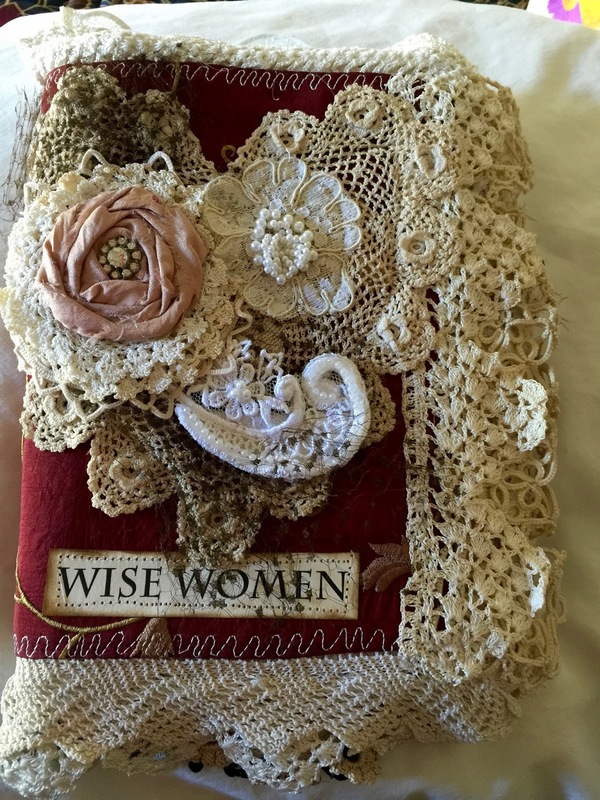 This has been my MOST FAVORITE lace book project ever! Probably because it was inspired and motivated by LOVE! 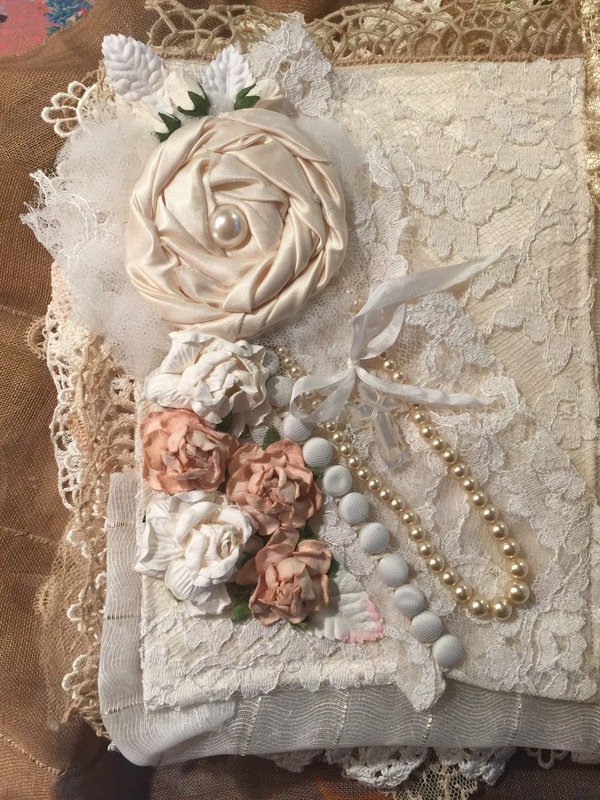 Mostly created with vintage wedding laces and trims. The pink rolled roses here are circa 1920. 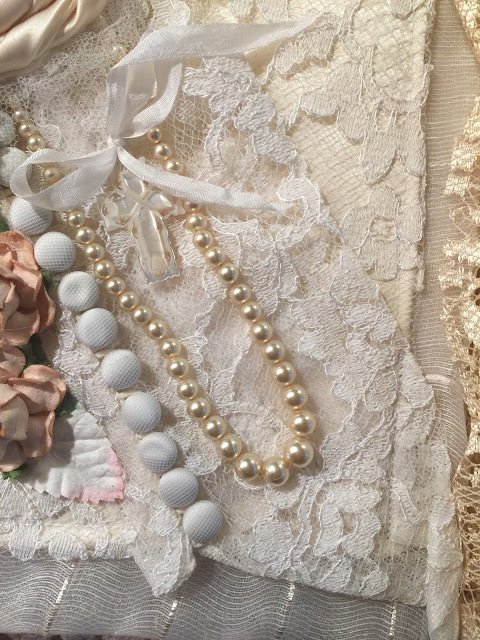 More 1920 flowers, plus a vintage rosary. You can see here, the foundation made with a beautiful set of vintage linen napkins. 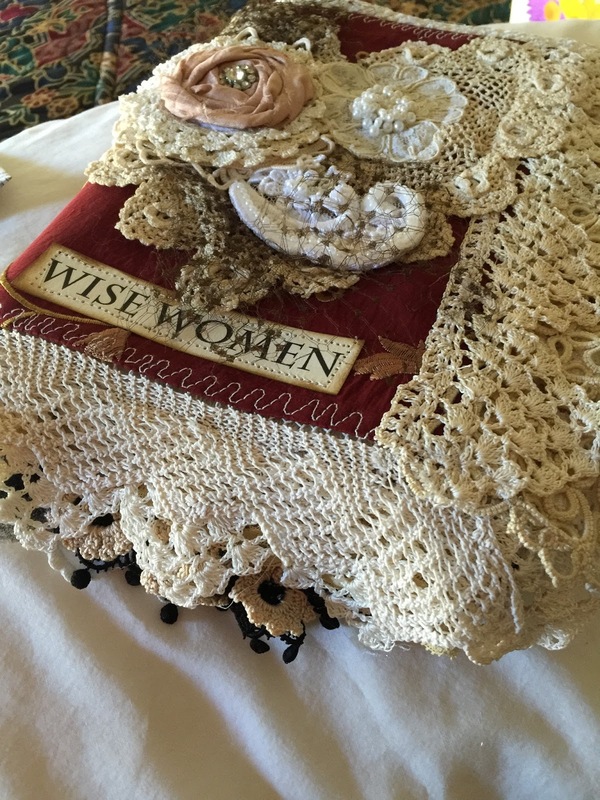 You'll see the beautiful crochet borders peeking out on most the pages. 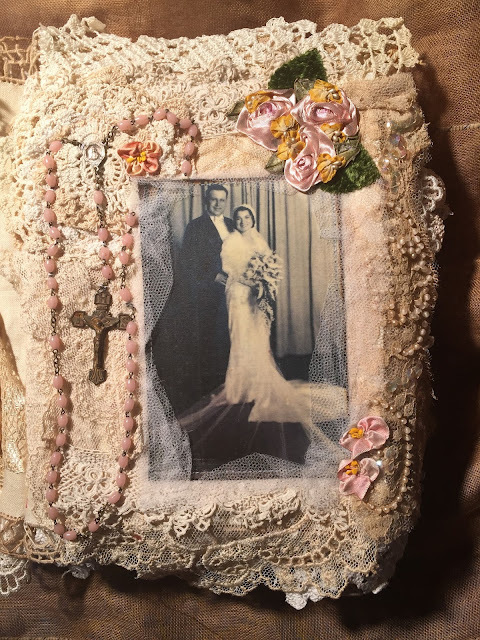 All the photos were photocopied onto Linen Paper, then I applied an encaustic glaze (hot wax). Behind this vintage glove is a pocket. The 1920's 'lily' flower reflects the bride's beautiful lily bouquet. 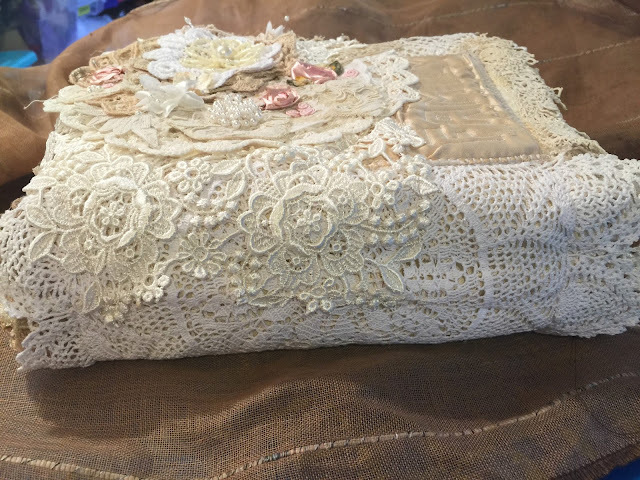 Closeup of a rolled rose made with vintage bridal satin, layers of laces, and some Mulberry paper roses. Also a vintage pearl necklace. I love all these buttons, each covered with satin and veil netting. The laces on this two page layout came from my cousin's wedding dress! The beautiful button sleeve forms a pocket. 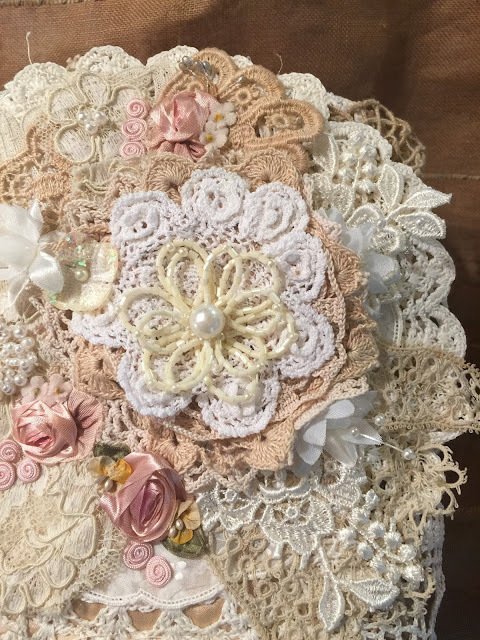 Many doilies and bits of lace make up this flower, topped with a vintage broach. 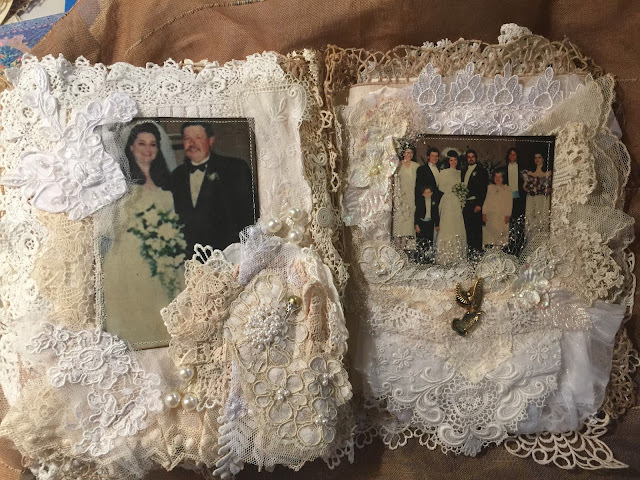 Bits of wedding laces, collaged to what felt 'right'. 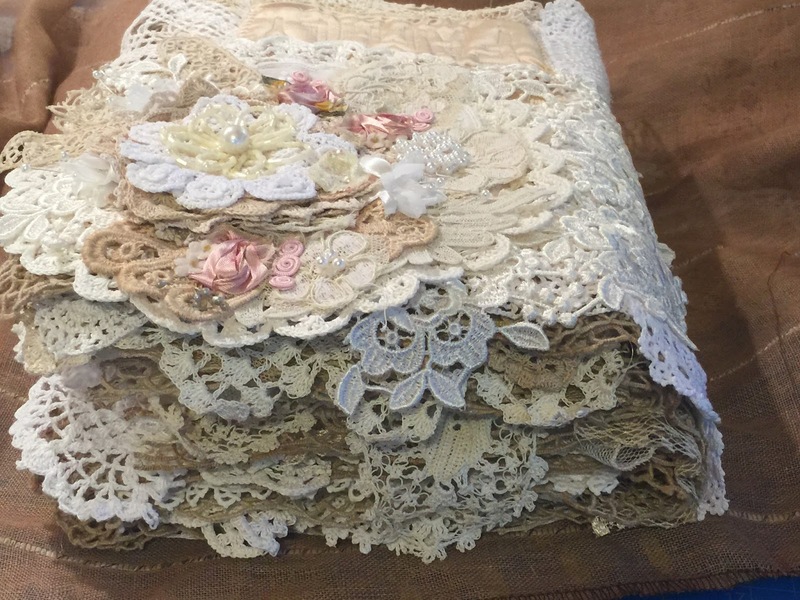 Tucking in those lace snippets. 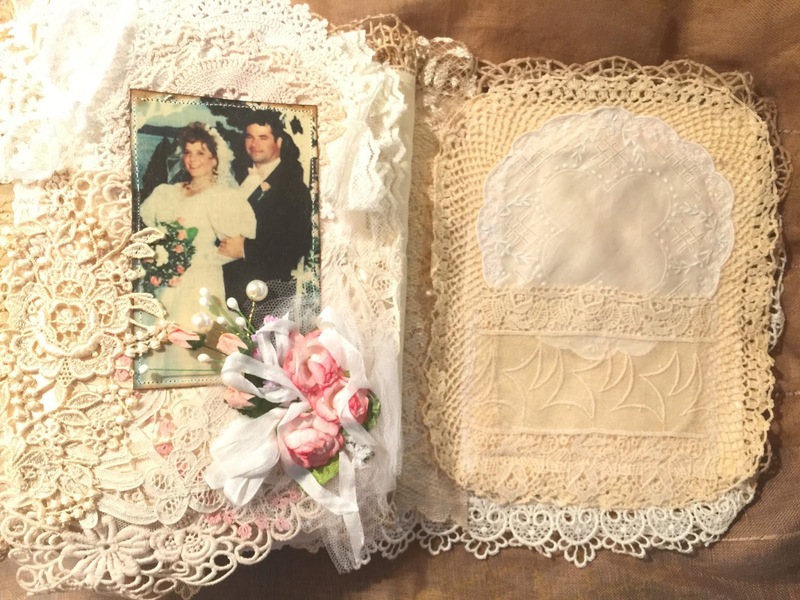 The little Mulberry flower bouquet on the bottom of this page reflects the pink roses and baby's breath this bride carried. 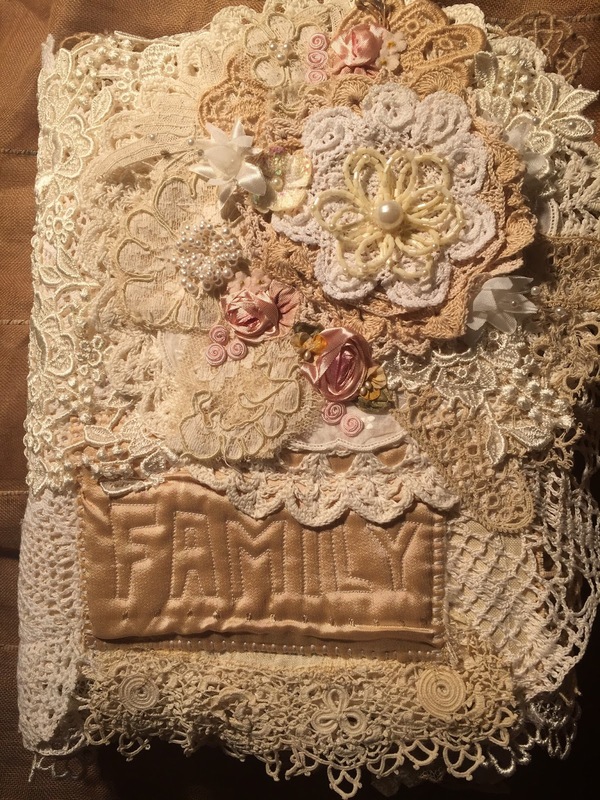 Closeup of the layers on the front cover. The beaded flower is a newer trip, but kept with the vintage theme. And, I just love those rolled roses from the 1920s. Found these, years ago, at the estate of a retired milliner. 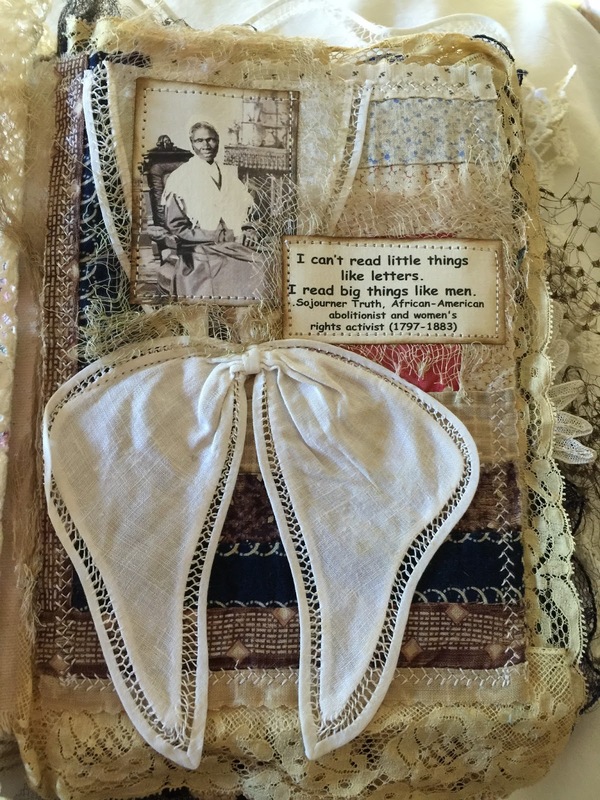 Her supplies were cataloged and dated 1910-1930s! I'm now down to my last dozen flowers. Didn't mind using them here since this has been a work of love. View from the top. I love, love,love the layers of laces peeking out! As I said, this was a labor of LOVE! I'm so excited to give it to her later this week. Going to attend the Ellen Show! Wow! I'm over the top excited about being in the audience of the Ellen Show next week. A big thank you to my cousins Angie and Betsy for gifting me two of their tickets. So, of course, I had to make a special gift for Ellen. She is truly one of the most precious gifts that bless us today. Always a positive note! Here's my 'Wise Women' book, dedicated to the fabulous Ellen Degeneres. 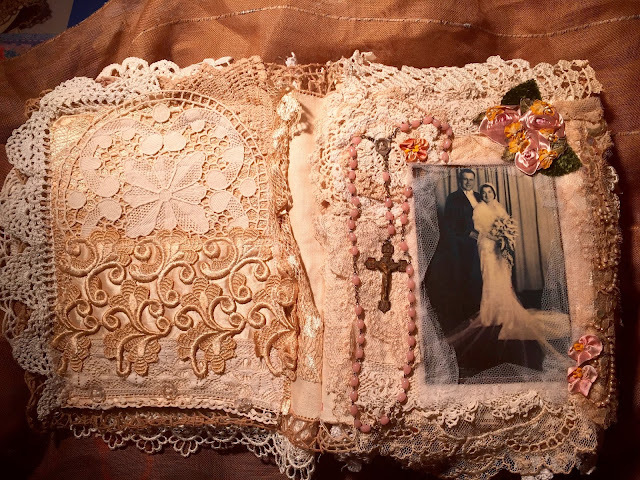 How this book was created… Most of the embellishments are made from vintage laces and fabrics. Doilies, millinery netting, vintage pieces of jewelry embellish each of the pages, somewhat keeping with the style of that era. 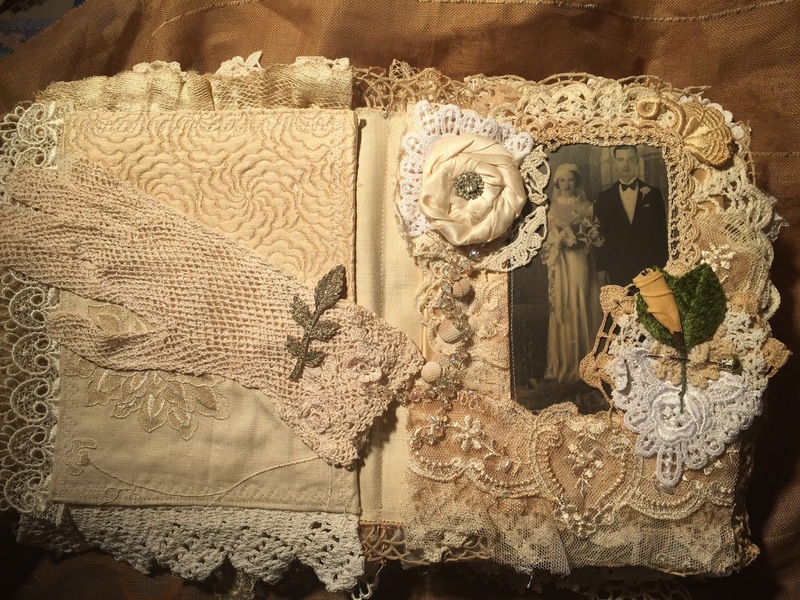 The photos were reproduced onto a lovely linen paper. Inside the front cover we are reminded of the ancient Wisdom of our African and Native American Fore-Mothers. 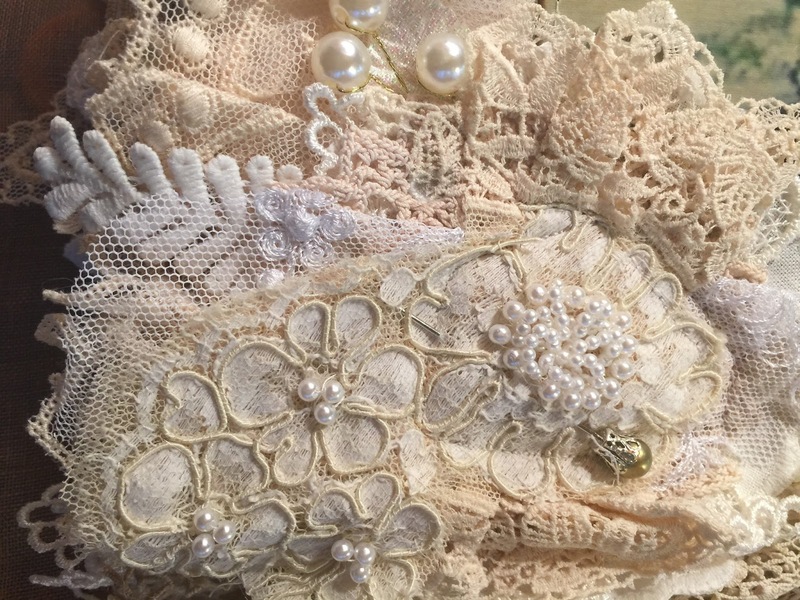 The delicate vintage lace forms a symbolic rainbow, suggesting love that surrounds us from our Matriarchal Lineage. Sojourner Truth (1797-1883) was an abolitionist and women’s rights activist. The foundation of her page is a log-cabin quilt square circa 1880’s. The red center represents the center/heart of the log cabin home. 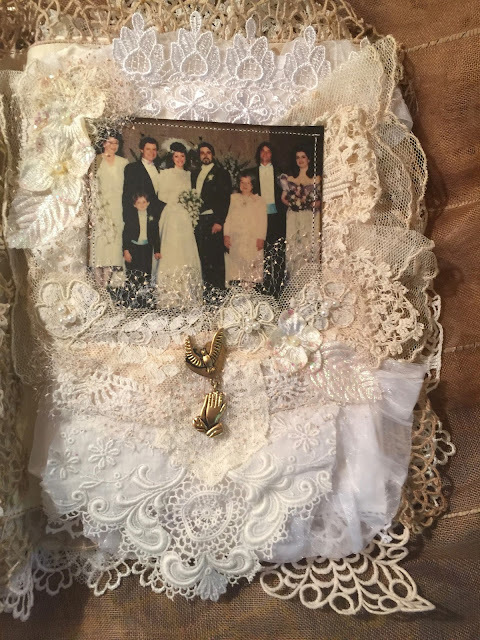 The collar tie is also vintage and very closely resembles the collar she is wearing in the picture. 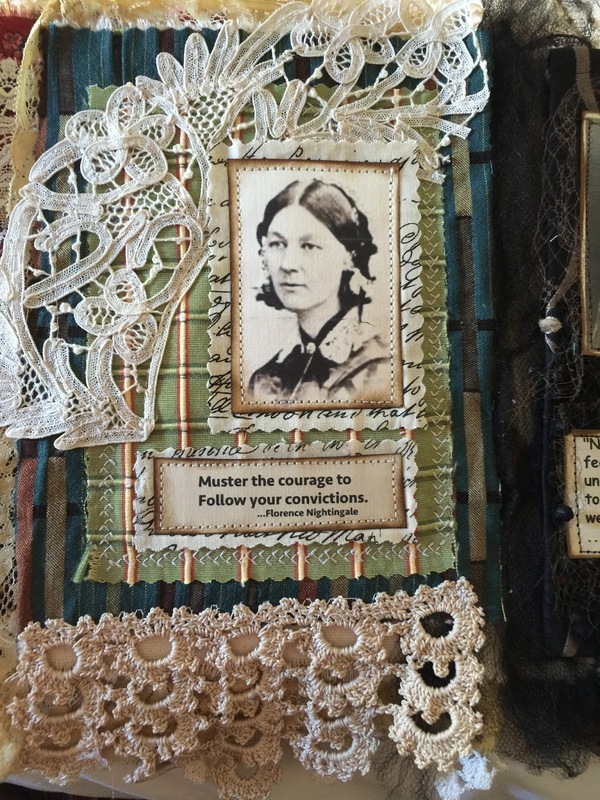 Florence Nightingale (1820-1910) the foundation of this page is created from rescued designer fabrics from FABMO, . 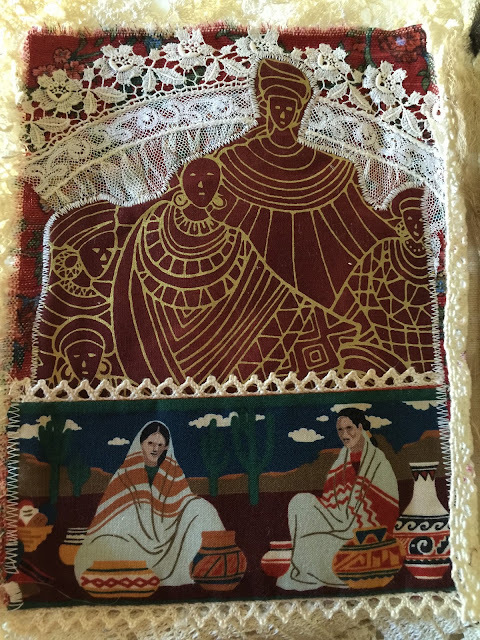 a non-profit organization that saves these fabrics from the landfills. 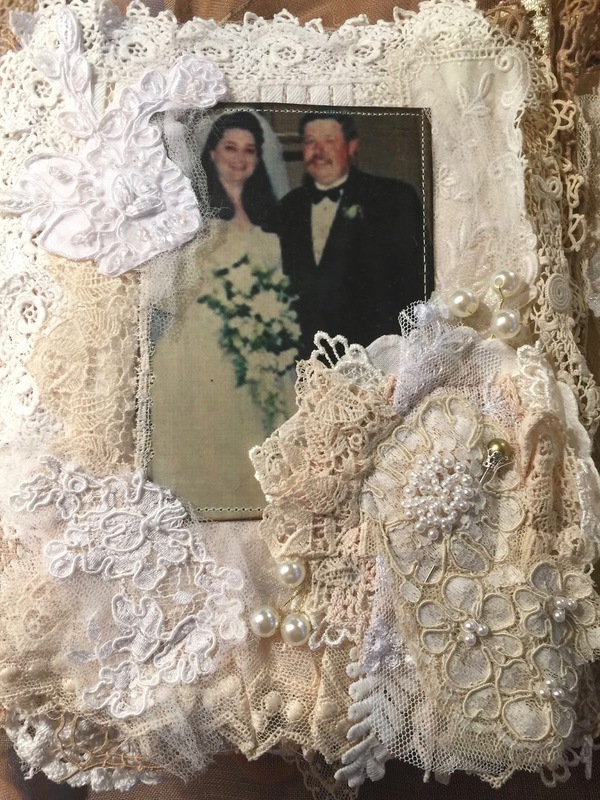 These two plaids are keeping with the style of her dress, as the pieces of Victorian lace replicate her collar. 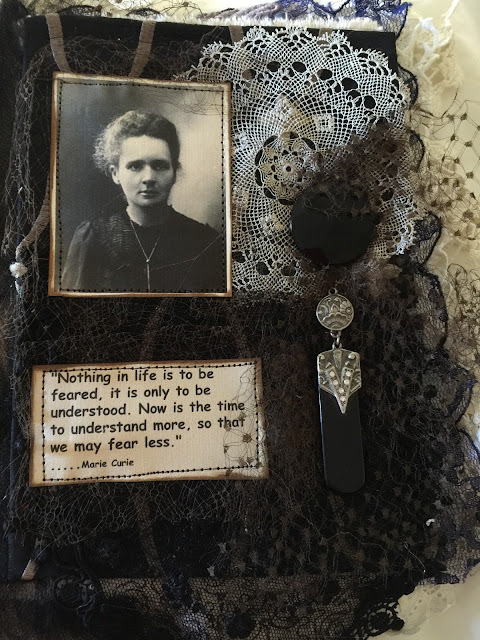 Marie Curie…(1867-1934) The foundation of this page is also created with rescued fabrics. The delicate millinery netting is circa 1910. 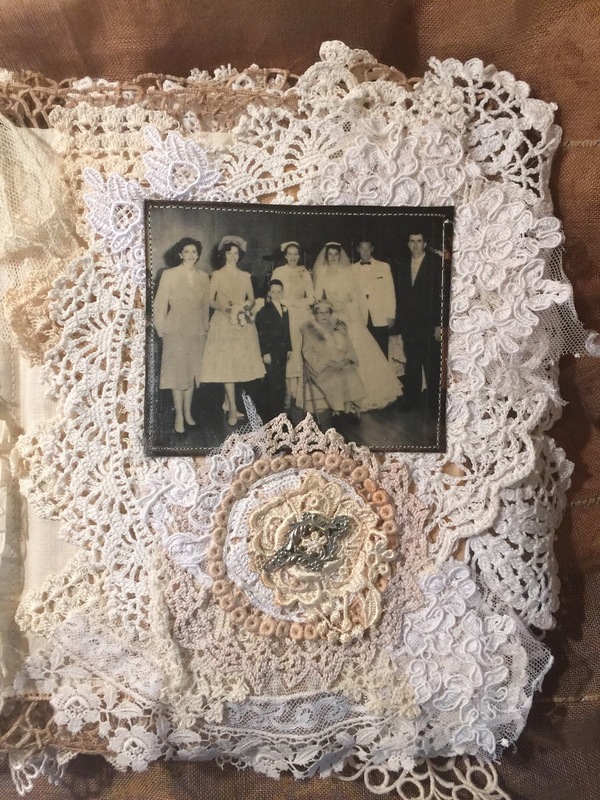 The piece of black lace is from a vintage mantilla. Both the glass button and the vintage jewelry are typical of the fashion of her era. Alice Paul…(1885-1977) The foundation of the page is similar to the fabrics of the early 1900’s. The buttons are vintage, age unknown, as is the milliner’s flower. 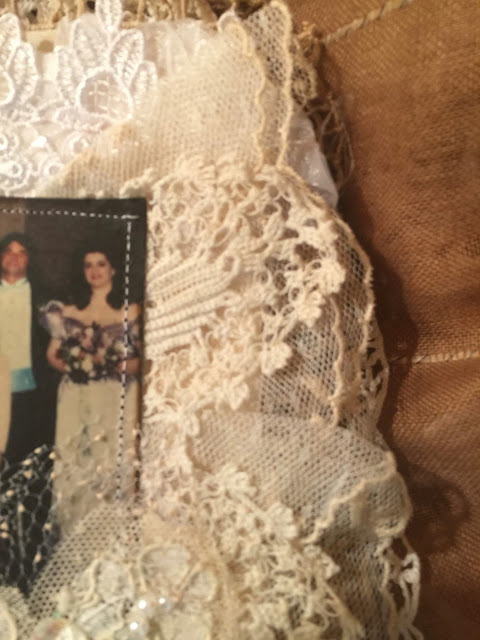 The tiny piece of lace is from the bodice of a vintage dress. 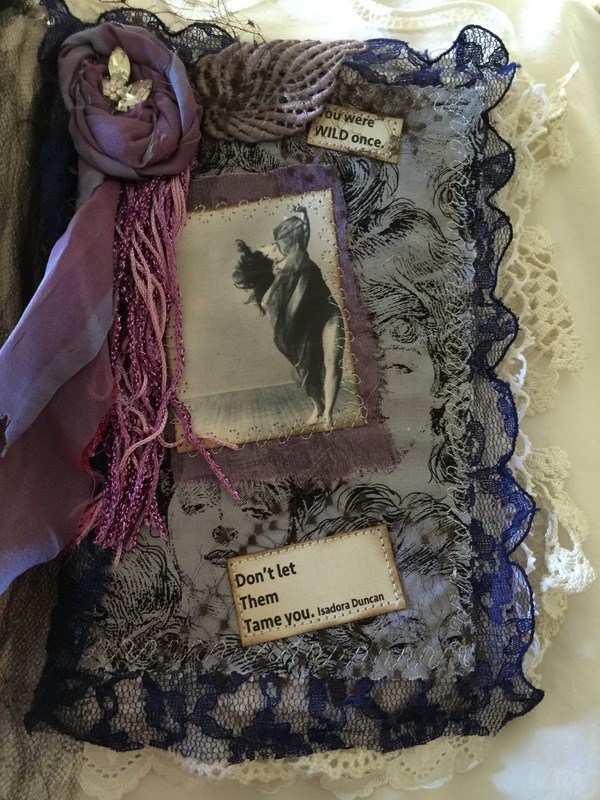 Isadora Duncan (1887-1927) reminds us to be in touch with our wild and free nature. The foundation of this page is a beautiful piece of cotton with Victorian women. The flower is handmade with a vintage clip earring embellishing the center. 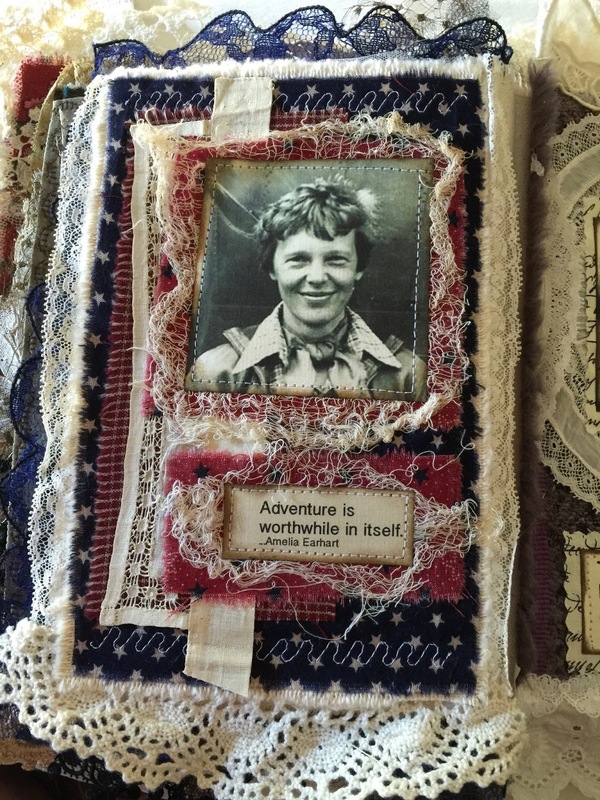 Amelia Earhart (1897-1937?) reminds us that ‘Adventure is worthwhile in itself.’ She wasn’t one to wear frills and laces, however, the stiff cuff is typical of something she might have worn. Anne Frank… (1929-1945) The foundation of her page is a piece of vintage wool, similar to the wool coat she is wearing in this picture. 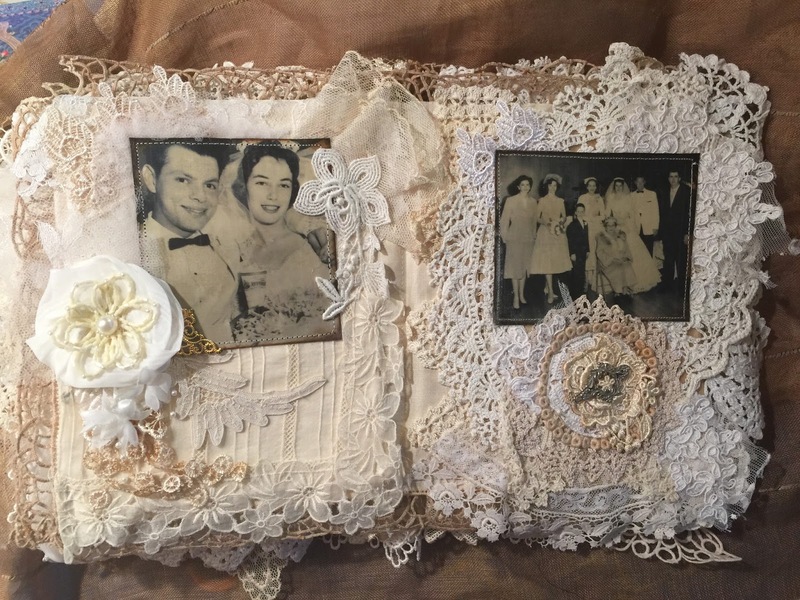 The lace trim on her page are from vintage Christening dresses. 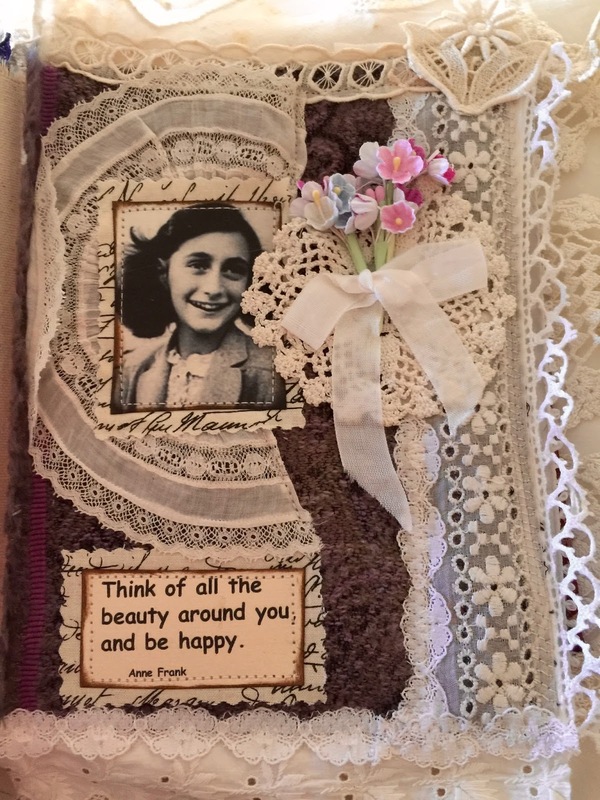 The flowers are reproductions, mindful of the beauty she saw everywhere. Mother Theresa (1910-1997) …Foundation is from a vintage Christening dress, similar to the fabric she might have worn. 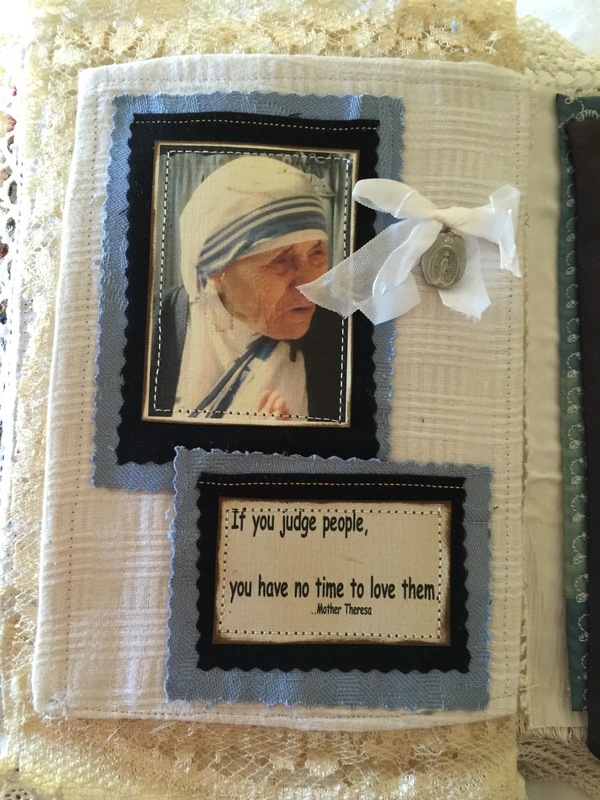 Plain and simple, no frills, her message is clean and sweet. 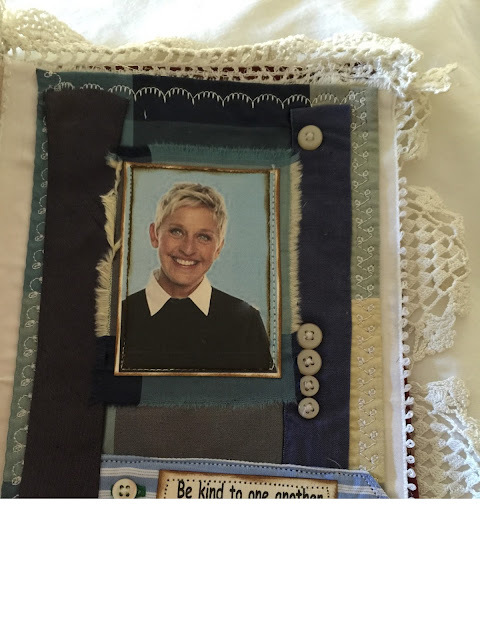 Ellen DeGeneres… The foundation fabric (rescued via FABMO) is in the blue and cream tones you seem to enjoy. The tie, buttons and shirt fabrics are from a memory quilt I’m making for a dear friend. It was truly a joy to create this book. 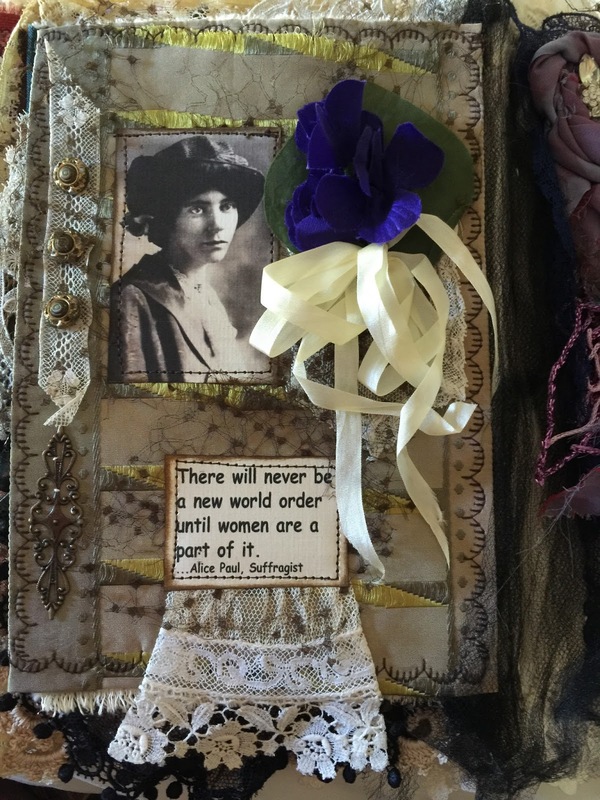 So thankful for those women who paved the way for the world we enjoy today!